The Buff-breasted Sandpiper is a slender shorebird that breeds in the high Arctic of Alaska and Canada, and winters in the grasslands of central South America. It is rare in Tennessee, but can be found during fall migration in various short-grass habitats across the state. Once an abundant bird, market hunting nearly drove it to extinction until legislation protected them, and most bird species, in North American in 1918 (the Migratory Bird Treaty Act) and in Argentina in 1920. The population is now estimated to be only about 15,000 birds. This medium-sized sandpiper is slender, delicate looking, and buffy all over, with a scaly pattern on the back and top of the head. The bill is short, pointed, and black, the head is round and plainly patterned, and the legs are long and yellow. The underside of the long wings is white. Immature birds (August-November) are similar to adults, but have more scaling on the back. Voice: Call is a low, soft greet. Baird's Sandpiper is buffy only across the breast, has white on the throat and belly, and has dark legs. Upland Sandpiper is larger, with a whitish belly, and barring on the sides. American Golden-Plover has a shorter, thicker bill, and darker legs. 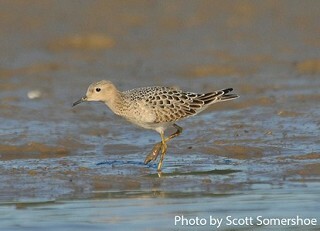 Habitat: In Tennessee, Buff-breasted Sandpipers use exposed mudflats, the edges of lakes and ponds, and a variety of short grass habitats such as mowed fields, golf courses, and airports. Nesting and reproduction: Buff-breasted Sandpipers have never been known to nest in Tennessee. Status in Tennessee: The Buff-breasted Sandpiper is a rare fall migrant in Tennessee, most likely to be seen from late August through late September, across the state. The mating system of Buff-breasted Sandpipers is unique among North American shorebirds, as they do not form pair bonds. Several males perform breeding displays in a "lek" area, the females visit the lek, choose a male (or more than one) and then build the nest, and raise the young on their own. Best places to see in Tennessee: Island 13 in Dyer county (now inaccessible) is a fairly reliable place to see them in late August through mid-September. Several were found at the Duck River Unit of Tennessee National Wildlife Refuge in late summer 2010. Rankin Bottoms is also a reliable place in late summer. Lanctot, R. B. and C. D. Laredo. 1994. Buff-breasted Sandpiper (Tryngites subruficollis). The Birds of North America, No. 91. (A. Poole and F. Gill, eds.). The Academy of Natural Sciences, Philadelphia, PA, and The American Ornithologists' Union, Washington, D.C.